This assignment is worth 40% of your grade for the semester (5% for the Annotated Bibliography and 35% for the final draft). It builds on the various skills we are working on this semester, combining your ability to construct an argument (short formal five-paragraph essay assignment) with your ability to read critically and analyze a text (in-class essay and class discussions). It will also allow you to practice researching and using and documenting secondary sources. Each of the assignment's components (Proposal, Annotated Research Bibliography (and Sources), Working Outline with Thesis Statement, Workshop/Peer Revising and Completed Paper) is a required part of this assignment and failure to hand any of them in will affect your final grade for this assignment. New Yorker, The Walrus, Wired, Vanity Fair, Canadian Geographic, Bon Appetit, Maclean’s, Canadian Living, Chatelaine, Adbusters, Maxim, Utne Reader, Sports Illustrated, Men’s Health, Women’s Health, Prevention. If you would prefer to analyze a magazine other than one of those listed, that may be possible, but you will have to come talk to me (Zora) during my office hours (after class) to get your choice approved before you hand in your proposal (due Oct. 10). 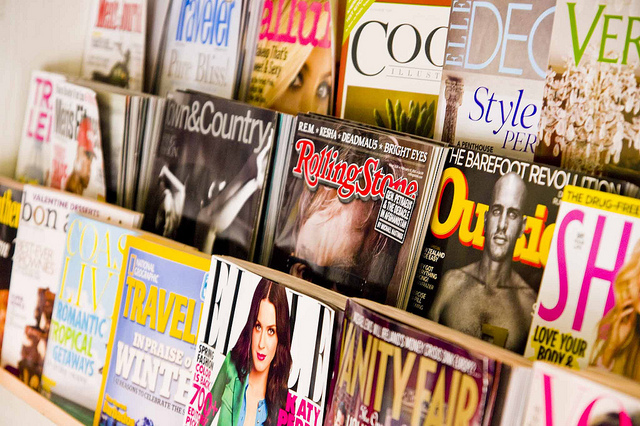 Be careful when you are selecting a magazine to purchase a regular edition of the magazine, not a collector’s edition or special edition that re-issues previous content: special editions do not tend to contain the advertisements that will help you determine your publication’s target audience. Please choose your magazine carefully: select something that you would like to spend some time analyzing and about which you have questions. As you work on this project, you will analyze your chosen magazine’s advertising and articles. You will attempt to determine who the magazine is aimed at (intended audience) and to determine the magazine’s purpose and the values that it promotes. You may also wish to research the magazine’s publication history and to evaluate its overall effectiveness. In thinking about audience, you may want to consider gender, age, income level, education level, nationality, and values. As you read your magazine, think about such factors as implied politics, required reading level, article content, and advertising content. Remember that your magazine may target readers’ fantasies rather than reality. As you work on this assignment, try to analyze rather than describe your magazine, and be sure to cite plenty of examples from the magazine (your primary source) to support your claims. Please note that this assignment asks you to analyze the entire magazine, not just one article or one topic from the magazine. The research component of the assignment will be determined by the questions that you have about the magazine as you analyze it. For example, you may want to research when the magazine first appeared and how it has changed in order to provide a context for your analysis of the current issue. You might also want to consider how your publication has addressed the challenges of maintaining a print identity in the current digital age. As you work on your analysis, you may also find it helpful to look more deeply into a topic that your magazine covers in order to assess your magazine’s way of approaching it.